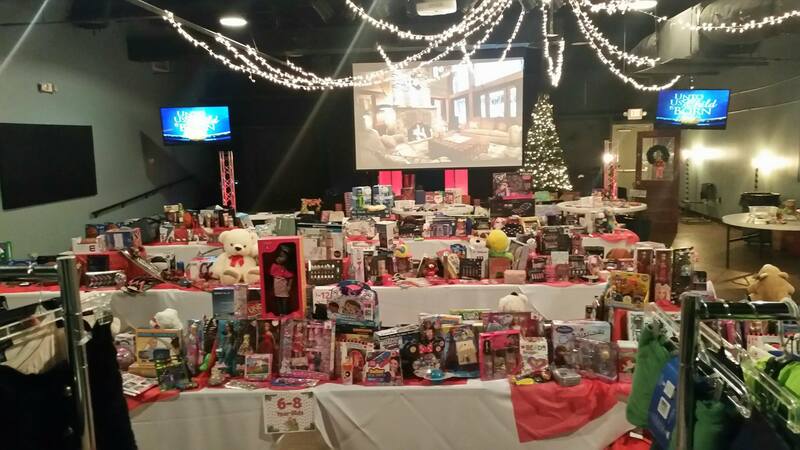 Peacemakers is holding its Second Annual Christmas Toy Store December 8 and 9. 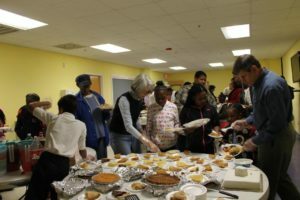 Last year, through the generosity of individuals and organizations in the Rocky Mount community and the tireless efforts of many volunteers, Peacemakers of Rocky Mount helped 250 families. This year, 345 families purchased 4,100 toys for their children at the Christmas Toy Store. For this outreach, local churches, organizations, and individuals donated new, unwrapped toys to Peacemakers, with price tags still attached. Peacemakers then repriced the items at 80 percent off. Invitations were sent to local low-income families based on school social worker and local agency referrals, and those families shopped at the “store”. “Our Toy Store features free wrapping stations so parents can wrap the gifts they purchase. They take pride in carefully selecting, purchasing and wrapping the gifts for their children,” Lewis said. The small amount of revenue collected goes directly back into other Peacemakers programming. Volunteers helped reprice donations, set up and decorate the store, and worked as cashiers, greeters and shopping helpers, baking cookies and serving refreshments. Additionally, volunteers assisted in the children’s craft room where young guests made special gifts for their parents. “Because of local contributions, Peacemakers helps address critical need, serving the South Rocky Mount community in many ways all year long,” Lewis said. “As an organization, we are dependent on the financial generosity of individuals and organizations in the Twin Counties. So, we say “Thank You”. For more information about the organization or year-end giving, please visit rockymountpeacemakers.org or call Jesse Lewis at 252.212.5044. Peacemakers of Rocky Mount will host its annual Hope Banquet fundraiser Thursday, October 5, 2017 at 7:00 PM at Englewood Baptist Church in Rocky Mount. Over forty years ago Dr. Lupton left a budding business career to live and work in inner-city Atlanta with delinquent urban youth and rebuild urban neighborhoods. As a result, families and children in need are being empowered to grow into healthy, productive adults, positively changing the culture around them. Dr. Lupton is a Christian community developer and entrepreneur who brings together communities of resource with communities of need. Lupton has developed two mixed income subdivisions, started a number of businesses, created housing for hundreds of families and initiated a wide range of human services in his community. 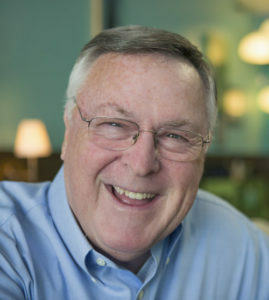 He is author of several books including the widely read, Toxic Charity, Theirs is the Kingdom, Renewing the City, and the widely circulated “Urban Perspectives”, a monthly reflection on the Gospel and the poor. Bob released a new book in July 2015 titled, Charity Detox. He holds a Ph.D. in psychology from the University of Georgia. At the banquet, Dr. Lupton will share his experience discussing ways to structure programs that improve the quality of the life of the poor and disenfranchised. For $240, table sponsors will receive eight seats with dinner catered by Something Different. Individual seats are $30 each. The deadline for table sponsorship is Thursday, September 28, 2017. For more information contact Donna Clifton at252.212.5044 or donna@rockymountpeacemakers.org. Peacemakers is a Christian non-profit organization serving South Rocky Mount with a mission to empower members of the community with the knowledge and skills necessary to lead successful and sustainable lives. 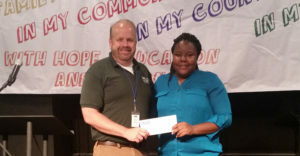 In the photo, Peacemakers Executive Director Jesse Lewis awards Takia Moody of Rocky Mount the Millie S. Morris Scholarship. 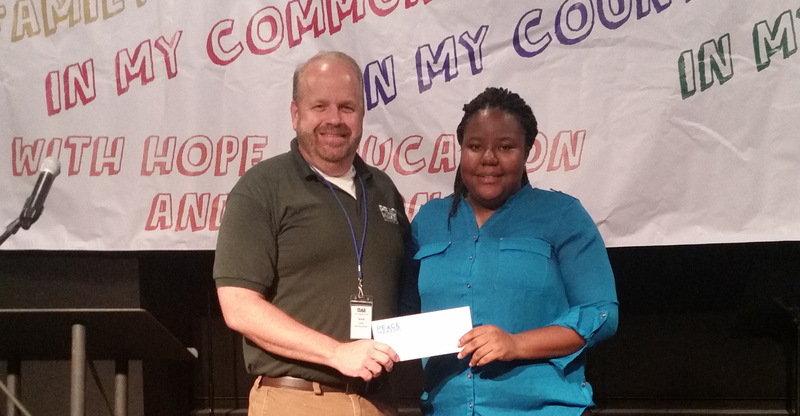 Peacemakers has awarded the Millie S. Morris Scholarship to Takia Moody of Rocky Mount. Moody attended Nash Central High School and plans to enroll at North Carolina Central University to pursue Criminal Justice studies in hopes of one day becoming an attorney. The Millie S. Morris Scholarship was established in March 2017 in memory of Mildred “Millie” Shields Morris of Red Oak. Morris was a long-time educator in Edgecombe County and Nash-Rocky Mount Public Schools who passed away in June 2016. The scholarship is administered through Peacemakers of Rocky Mount. 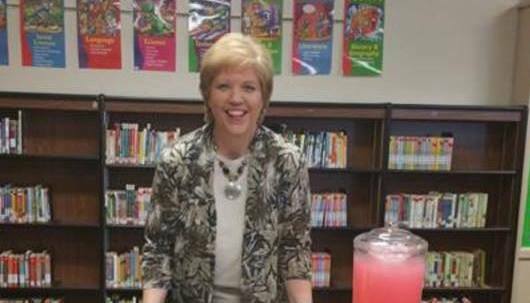 She was a devoted Christian who possessed a great passion for educating young children and was known for her heart of compassion for the students and families she served, particularly those from economically-disadvantaged households. Morris taught in Edgecombe and Nash County schools until she retired in 2015. The Millie S. Morris Scholarship is a $1,000 annual scholarship awarded to a student attending a two or four-year accredited institution of higher learning. Students who reside in the South Rocky Mount Community, and who have been accepted to an accredited two or four-year college or university are eligible for consideration. Recipient must have a minimum high school grade point average of 3.5 on a scale of 5.0, or 3.0 on a scale of 4.0. Peacemakers is a Christian community development organization serving the under-resourced area of South Rocky Mount with a mission to empower members of the community with the knowledge and skills necessary to lead successful and sustainable lives. For more information, call (252) 212-5044 or visit rockymountpeacemakers.org. 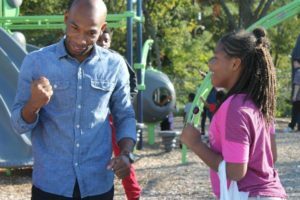 Peacemakers of Rocky Mount will again host a summer enrichment program called Freedom School for 180 children each weekday this summer beginning June 19. In addition to the program in South Rocky Mount, the organization will operate a second location in Tarboro thanks to the generous support of Edgecombe County Schools. 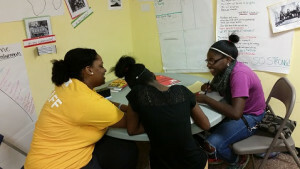 Using curriculum designed by the Children’s Defense Fund, Freedom School helps rising first through ninth graders fall in love with reading, increases their self-esteem, and generates more positive attitudes toward learning. 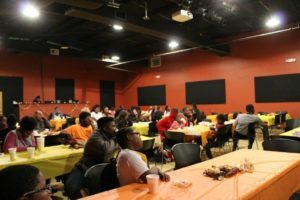 “The program has gained so much popularity over the past six years that we have to turn away applicants each year,” Peacemakers Executive Director Jesse Lewis said. Local children are taught using a model curriculum that supports children and families around five essential components: high quality academic enrichment; parent and family involvement; civic engagement and social action; intergenerational leadership development; and nutrition, health and mental health. The program, like many of Peacemakers’ activities, is sponsored by a number of private foundations, government agencies, and individuals. 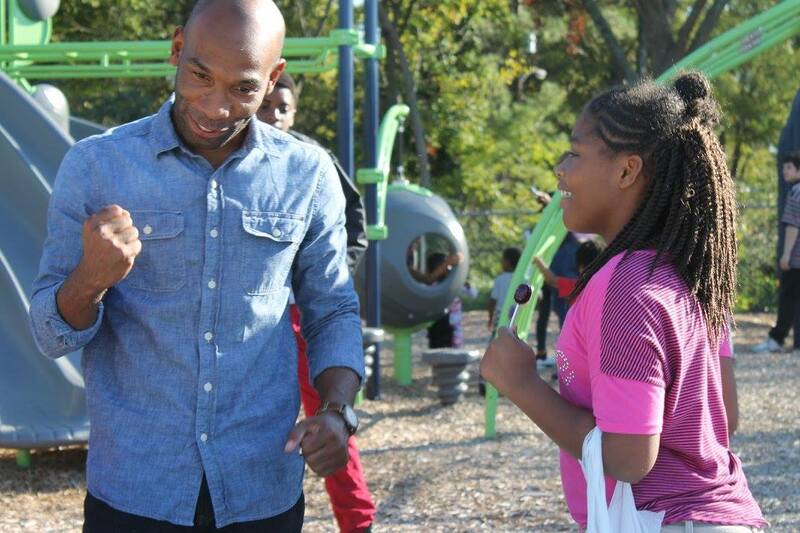 The program also offers parents and family members the support and skills they need to help their children succeed. Participants are pre and post-tested to document their progress over the eight weeks. Data from last year show on average the children increase their reading level by 14 months. “Children who participated last year, demonstrated a desire to spend time reading, when they had minimal or no desire to read at the beginning of the program,” Lewis said. Additionally, improvements are made in level of self-confidence including better self-perceptions of identity, ability to succeed academically, desire for future positive growth and understanding of career options available to them. Peacemakers is a Christian community development 501c3 organization serving the under-resourced area of South Rocky Mount, by empowering citizens with the knowledge and skills necessary to lead successful and sustainable lives. Peacemakers strives to tangibly demonstrate the love of Jesus Christ in such a way that it results ultimately in the complete transformation of the community and its people. For more information email jesse@rockymountpeacemakers.org, call 252-212-5044 or visit www.rockymountpeacemakers.org. Gifts of support are accepted throughout the year online, by mail to: 1725 Davis Street, Rocky Mount, NC 27803 and in person. The Millie S. Morris Scholarship was established in March in memory of Mildred “Millie” Shields Morris of Red Oak. Morris was a long-time educator in Edgecombe County and Nash-Rocky Mount Public Schools who passed away in June 2016. The scholarship is administered through Peacemakers of Rocky Mount. Morris was a devoted Christian who possessed a great passion for educating young children and was known for her heart of compassion for the students and families she served, particularly those from economically-disadvantaged households. “Millie Morris’ legacy will continue for many years to come, as children in South Rocky Mount pursue higher educational opportunities, and make a positive impact on our community,” Peacemakers Board Chair, Kelley Deal said. The Millie S. Morris Scholarship Fund awards a $1,000 scholarship annually to a student attending a two or four-year accredited institution of higher learning. Students who reside in the South Rocky Mount Community, and who have been accepted to an accredited two or four-year college or university, may apply for the scholarship. The recipient must have a minimum high school grade point average of 3.5 on a scale of 5.0, or 3.0 on a scale of 4.0. Millie Morris was educated in the Rocky Mount city schools, and then graduated from Appalachian State University with a Bachelor of Science in Elementary Education and later became a National Board Certified Teacher. She taught in Edgecombe and Nash County schools until she retired in 2015. Applications for the 2017-2018 academic year should be submitted by 5:00pm on May 12, 2017 in person at Peacemakers, 1725 Davis Street, Rocky Mount, NC during normal business hours, or by email to jesse@rockymountpeacemakers.com. The scholarship will be awarded on or before May 25, 2017. 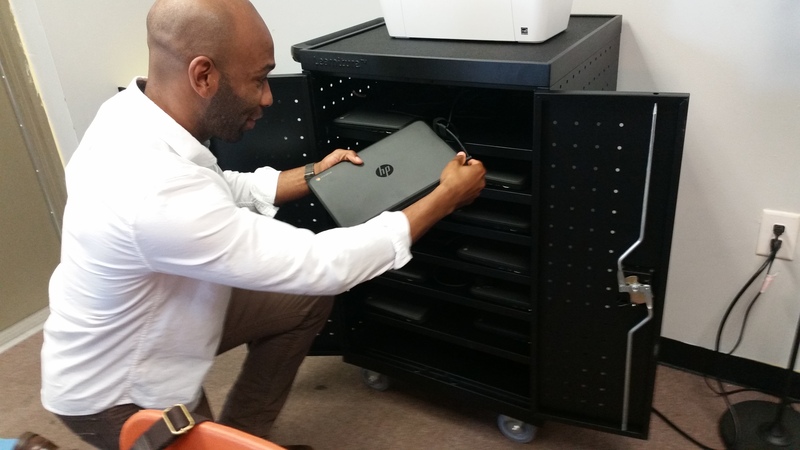 In the photo, Manny Williams, Peacemakers Behavior Specialist and After School Coordinator, uses a new Google Chromebook at the charging station, both donated to Peacemakers by First Presbyterian Church of Rocky Mount. Peacemakers has upgraded technology available to South Rocky Mount residents thanks to the support of The Longleaf Fund and First Presbyterian Church of Rocky Mount. The Longleaf Fund, through its Seeds of Hope grant program, awarded capital grants in select cities in North and South Carolina in order to strengthen the character and achievement of children and youth, while encouraging communities to reach higher and create opportunities for a brighter future. The Seeds of Hope grant provided generous support to help fund the refurbishment of Peacemakers’ computer lab which serves students and adults on a daily basis. Peacemakers features an open-access 14-unit Windows-based computer lab that is open to anyone six days per week. Neighborhood children use the lab to work on school work, while many adults utilize the lab for completing online job applications. First Presbyterian Church of Rocky Mount recently donated 12 Google Chromebooks for the lab, along with a charging station for the laptops which will allow the organization to extend the technology throughout the center. Peacemakers is a Christian community development organization serving the under-resourced area of South Rocky Mount with a mission to empower members of the community with the knowledge and skills necessary to lead successful and sustainable lives. Peacemakers and the Peacemakers Thrift Store are located at 1725 Davis Street in Rocky Mount. For more information or to schedule a tour, visit rockymountpeacemakers.org or call 252.212.5044. Residents of South Rocky Mount participated in Peacemakers of Rocky Mount’s 2016 Thanksgiving Dinner Sunday, November 20. Peacemakers is a Christian community development organization serving the under-resourced area of South Rocky Mount with a mission to empower members of the community with the knowledge and skills necessary to lead successful and sustainable lives. Special thanks to donors and volunteers for helping make the event possible. Peacemakers is located at 1725 Davis Street. Peacemakers held its Fall Family Festival Saturday, October 29, 2016 at their location at 1725 Davis Street in Rocky Mount. Over 200 community members and volunteers participated in games, enjoying great food and fun for all ages. Peacemakers is a Christian community development organization serving the under-resourced area of South Rocky Mount in Rocky Mount with a mission of empowering members of the community with the knowledge and skills necessary to lead successful and sustainable lives. For more information, or to participate in the organization’s monthly luncheon and tour, call 252.903.8856. Southern Bank presented a $5,000 gift to Peacemakers of Rocky Mount in support of the After School Program. 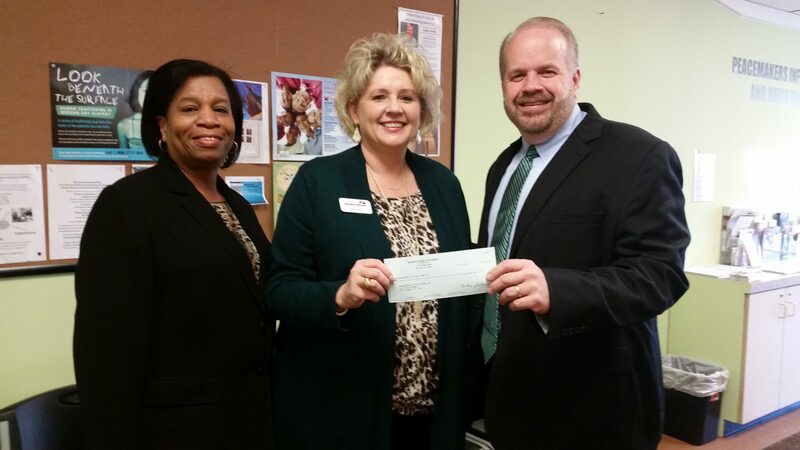 Southern Bank has committed a $25,000 investment to Peacemakers in South Rocky Mount. Pictured from left, After School Program Coordinator, Paula Jones, Southern Bank Vice President and Community Banker, Kim Sutton and Peacemakers Executive Director, Jesse Lewis. Peacemakers is a Christian community development 501c3 organization serving the under-resourced area of South Rocky Mount by empowering citizens with the knowledge and skills necessary to lead successful and sustainable lives. For more information, call 252-212-5044. Jamilah, a teacher at The Freedom School, finds joy and beauty in connecting with the 12 middle school scholars in her class and the blessing of being a role model to even younger students. She described an interaction in which a 10-year-old was crying and clinging to a book. Jamilah, who also sought solace in books when she was younger, sat down with her, asked her what was going on. She reminded the sad child that she was special, loved and beautiful. The little girl was inseparable from Jamilah from that moment on. believes that this method fosters a relationship and grows trust between the teacher and the scholar. Jamilah sees beauty in the challenges and gifts of her childhood – a father who died suddenly when she was young, a mother who worked three jobs to take care of her family, the responsibility of helping with her younger brother – all of which helped shape her heart for God and for others, especially her scholars in Freedom School. 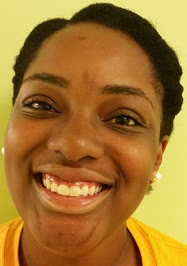 During the school year, Jamilah is a teacher in Halifax County, inspiring a love and mastery of Social Studies in the 9th through 12th grades. Spreading beauty wherever she is, Jamilah is an inspiration at the Freedom School at Peacemakers of Rocky Mount. Go to Peacemakers to meet Jamilah and see how lives are changing in South Rocky Mount.